My family went up that road in early 1965, a heroic feat in a 1961 Falcon 2-speed auto wagon. that food platter looks unreal! I rode a pushy, twice to the summit.late 70s. I don't remember if there were cars up there. I think they stopped at the turntable at Rawson's Pass. Where the toilets are now. person s, are you sure this isnt you? The 'road' from Charlotte Pass to the top of Kosi is not that steep really. Has anyone seen a trail map of Guthega from some time in the 80's showing a proposed quad chair? They have maps for most resorts in the world going back 50 years... but sadly not for Guthega in the year or two that the proposed lift was shown on the trail map. My guess is the description included the word 'proposed'. I missed this gem when originally posted - it's extremely impressive. Actually our Falcon was the previous model. Perhaps they had a different tranmission by the time the ad was filmed. I would probably have it in my collection, if only I knew where my collection was. Theorising about where the new lift will go? The proposed quad at Guthega in 1990/91 started 100m S/E of the bottom of Cow Pastures poma on the other side of the creek and terminated at the top of the " Mother in Law" run. Barry Turrel the lift maintance manager at Perisher will have more info on this as he was the Guthega lift manager at the time. I don't recall it being in a lift map but i could be wrong. I'm sure it was on the trail map otherwise I would not have known about it. However I'm wondering if it was proposed earlier than you mentioned as Guthega was bought by Blue Cow in 1991 and amalgamated in 1992. I thought I remembered it on the map from the days when Guthega was independent. Hey,there was a relief model of the Guthega lift lying around in the ski centre (in Mahoney's office and at Guthega hotel) in 1986 to 1988. Where is it ? Me mate's XA Falcon wagon would pull low 9 litres per 100km cruising to the snow, fully laden with 3 blokes, ski gear and a week's worth of food and beer. Hammer it though, and the fuel needle just sank. Nothing like an old Falcon. ... and it went to Guthega a few times.... no chains. It's weight just plowed it through. I'm almost certain I still have a copy of that elusive trail map in my caravan in Berridale. I might not get down there for a while but if I remember I'll bring it back and scan it. The lift was definitely labelled as "proposed quad" (and if it is ever built, I would be so happy to see it actually named that!) and it was marked running as described in the quote. Any new lifts these days would probably get named after some random sponsor's favourite model of car, sadly. What's the best name people can come up with? here is an old thing I did, a month or so ago... Guthega has been, and still is, divorced from Perisher. We tried to solve that. With all the lift updates Perisher requires, this lift would surely be at the bottom of the priorities list. I would hate for Perisher to spend money building this chairlift without building the more desperately needed lifts first (Mt P 6, Guthega Quad, Happy Valley Quad, Pretty Valley Quad, Smiggings Quad, Terminal re-alignment). This is an access lift - that windblown hill would not make a reliable ski run, and it opens no new terrain. Yes, it would give you a quick and easy way out of Guthega, but isn't this lift an attempt to balance the skier density by getting more people skiing IN Guthega? Assuming they put in the Guthega Quad, all you need is a Racecourse T-bar and you've got the best value-for-money link to Guthega, with all runs on the protected side of the hill. It's not the most direct of links, but do we really want to blow the expense and build a fast and direct link, and destroy Guthega's unique quality? Lucky someone captured some of the old images from the Perisher Ski Slope Master Plan, first pub. around 2002. Perisher have taken it off their site. .. and this might interest some. 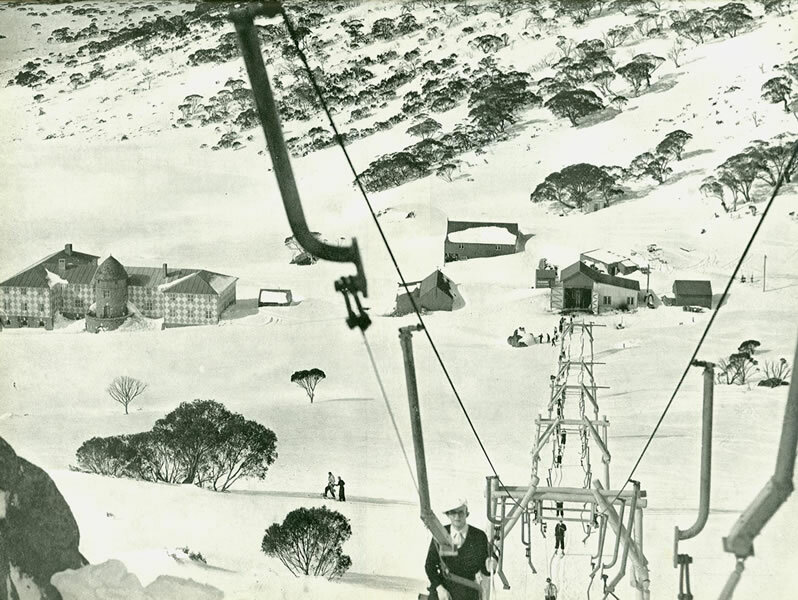 Just for Bogong, here is a photo of the original lift at Perisher, the North Perisher Rope tow. This website http://www.australianalpineclub.com/pages/H_prt6/H_prt06_03.htm has a lot of information about the development of Perisher and thredbo as well as information on the Northcote tow and the Tate East Ridge Tow. Thanks for the new pics Acav. There are lots of pics of the 1938 Meat Hook, although those are especially good ones. But that's the first photo I've seen of North Perisher. I wasn't sure if it was just a simple rope tow, but that photo shows that it was set up as a proper nutcracker complete with towers and pulleys to support the rope and people using tow grippers. It's a shame that very little has been written about the history of Perisher, the four other big resorts have lots of stuff published, so the lack of anything much on Perisher's history was especially obvious, so that article is a useful resource. As a Victorian, I don't know enough (or know the right people), to write anything, but my 12,000 word history Donna Buang: the forgotten ski resort (1925 - 1954) is on schedule to be out at the end of the month. is that north perisher rope tow just next to where the interceptor would be coming up past where the tow starts? looks like there was a lot of snow when that picture was taken, not many rocks showing and the creek down the bottom looks completely snowed over. 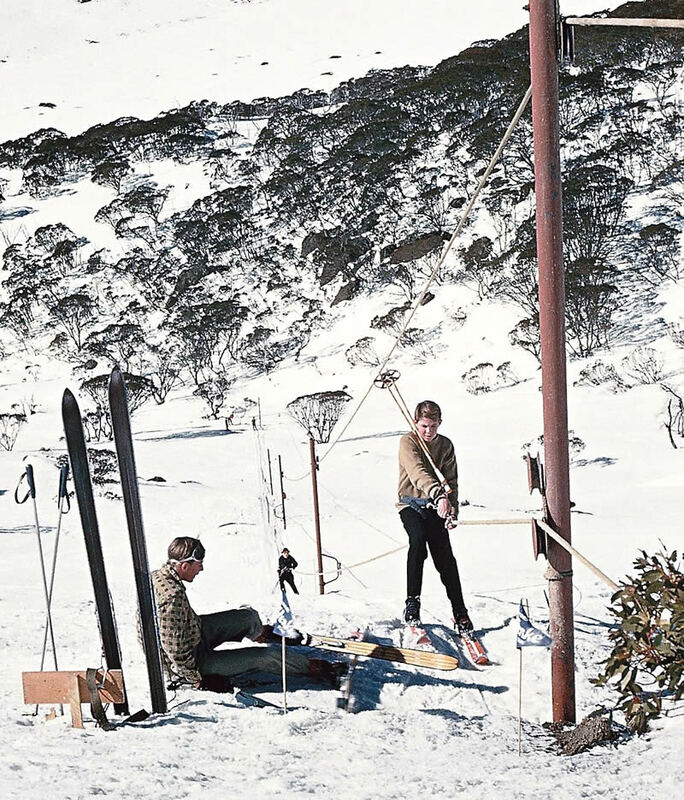 it was interesting to read that the basin at thredbo was skiable from april 1960 right through until winter 1961!! That is where I thought it was as well. The base station looks to be where the base of the interceptor is now, heading up near to where the Nth P t is now. I was thinking the base of the rope tow would be in between the base and mid station of interceptor. I think the base of the interceptor is a bit further down towards the creek. Hi folks. I've come across this old logo on a website last updated in 1999 and I was wondering if anyone remembers it. Was it the official resort logo just after the merger, or was it just an attempt to make one up? Seen it before, it did get a run, but I can't remember when or for how long. Bogong, I think that was in 95, the season I worked at Blue Cow. It was definitely around during the 94 or 95 seasons.I've still got some of their big promo posters from that time,laminated and hanging up in the shed and house,much to my wife's annoyance.At the top it says &quot;Ski it to believe it&quot; it has got 2 skiers skiing through some fresh snow over a small cornice and it has that small logo at the bottom,and the other one is of a snowboarder making some nice turns and says &quot;Just because it's cold,Does'nt mean its small&quot; and has the small logo at the top.I can't remember which season I got them, 94 or 95.I'll try and take some pictures of them and put them up,also got some from Thredbo.Just got to figure out how to put pictures up on the forum. Thanks guys. Strangely I don't recall seeing it before, so when I stumbled upon the logo, I wasn't 100% sure if it was authentic. 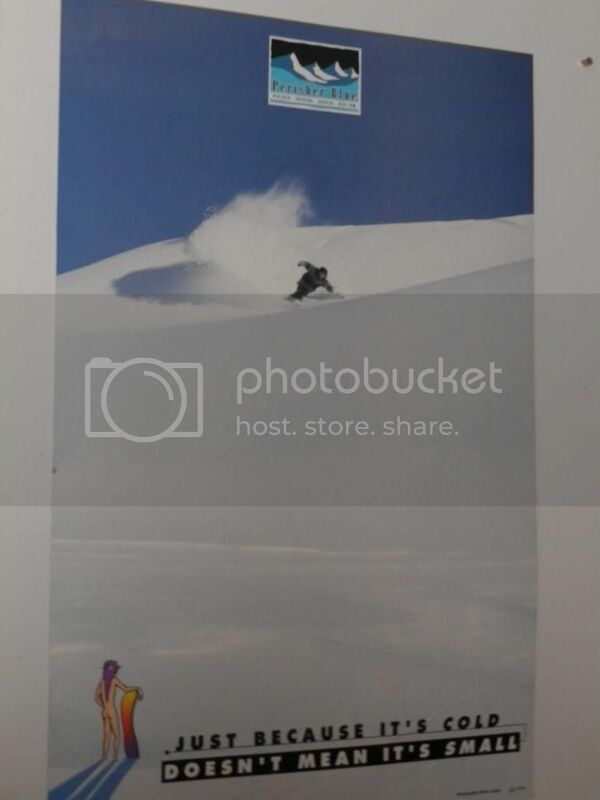 I think the merge between Perisher/Smiggins and Blue Cow/Guthega happened before the 1995 season, so it probably dates from 1995? One way is to upload them to photobucket (resize smaller). You can copy &amp; insert into your post. Anything documented on snowboarding in Guthega in early or mid 1980's when snowboards where initially banned from Perisher lifts? But I think I got this and a few other promo posters sometime during the 95 season. I 'collect' logos on sloppy joes and T shirts. I only buy them if they are the official logo and I have this in my collection on a sloppy joe. It was still in use in the early 2000s. I have a trail map from back then, part of a heavy dark blue theme.